While we had expected Activision to unveil the Wii and 3DS version of Skylanders SuperChargers at Gamescom, when doors open today what we'll see is something much more substantial. Not only have we a new online multiplayer kart racing game in all versions of Skylanders SuperChargers, but also online for the main campaign. Beenox, which is responsible for the Wii and 3DS games, has also contributed these Kart Racing modes to the main Wii U (and PlayStation and Xbox) experience. 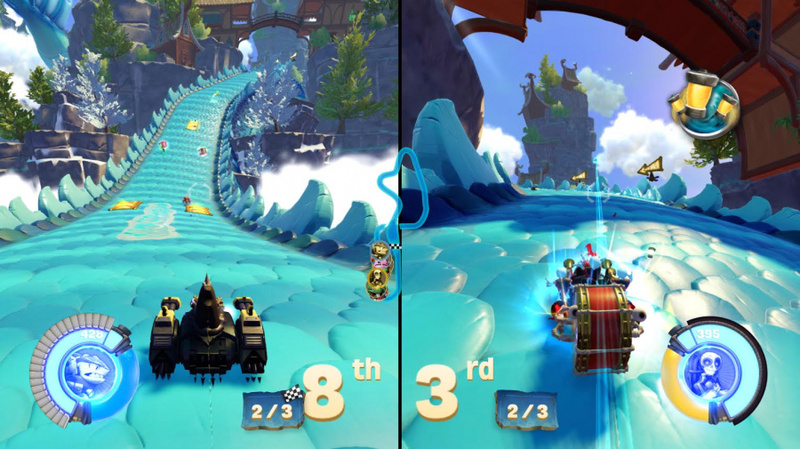 The new mode offers three styles of racing across Land, Sea and Sky. Each circuit offers not only different vehicles but also different vehicle handling. This is further supplemented with three-lap time trials with an online leaderboard. The press release states that all versions of Skylanders SuperChargers Starter Packs include the kart racing experience, which suggest that the Wii game will not stray far from this formula — albeit in less graphical fidelity. Each Starter Pack offers six tracks out of the box – two each for Land, Sea and Sky. If playing locally it seems you can only race against one other human opponent — something of a shortcoming compared to the likes of Mario Kart. Online, however, you can challenge up to three other players. This Starter Park racing is extended by new Racing Action Packs. Each of these (of which there is one for Land, Sea and Sky) unlock a variety of content. They include a SuperCharger Skylander and vehicle paring along with a specific villain trophy. The villain trophy, which we have seen previously in the Dark Edition Starter Packs, unlocks two new tracks and new modes, including SuperVillain Cup, Boss Pursuit and Mirror Cup. There are 12 boss villains across all three packs, with four in each pack, which players can defeat and play as. A little like last year's Trapping mechanics, players can store these boss villains on their villain trophy toy to play at a friend's house. We're still to see the Skylanders SuperChargers Racing game first hand on Wii and 3DS. More details were included in the press release, however - they will include new tracks, power-ups, boosts and hazards. The 3DS will also offer "head-to-head and competitive multiplayer" via local play or online with up to four players. And of course these come with the crossover amiibo Skylanders that also function in other Nintendo games. While the Wii and 3DS are still being talk about in terms of being a complimentary experience, it is good to see that development here hasn't been separate to the other versions. Certainly, with Beenox at the helm it seems the idea of a kart racer for the Wii and 3DS has in fact benefited the next generation consoles by adding this feature for all players. In amongst the news here are the Trophy toys in the Action packs. These will be particularly interesting to fans of the game as they create the possibility of playing as Kaos himself — and even driving his vehicle. More time is needed with the Kart Racer mode to get a real feel for it, but first impressions are strong. Certainly the lack of four player local play is a negative but elsewhere the experience impresses. A satisfying balance between battling and racing is struck by resisting the urge to "rubber-band" trailing drivers; like Mario Kart assistance is kept to offering those at the back enhanced power-ups. Add to this the ability to develop and modify your vehicle in the campaign mode before taking to the racing track, and this offers a lot of additional value for Skylanders fans this year. This... The vehicles aren't all they're showing of this game at Gamescom, is it? Whenever I see these racing sequences, I can't help but think they just look less tight and entertaining than Mario Kart and kinda by-the-books in themselves... I wanna see more of the on-foot sections, so tired of seeing all the kart segments. They just don't look that fun. I wanna see what attacks the new characters have on the ground. I wanna see how I can upgrade them. I wanna think about how I could apply their moves against enemies. That's what I liked most about all the past games, and with the focus on vehicles in this game that aspect seems to be holding back the on-foot sections by breaking the pacing and forcing the devs to diverge attention to vehicles. I know you can also upgrade and mod vehicles, but they seem to be restricted to small areas and don't have the same personality as a Skylander, so I doubt I'd get attached to them. Plus, the Air and Land sections don't really look deeper than the past vehicle minigames. That you can only have four players together online, and the rest are just CPUs, that seems like it'll hamper that part of the game too. it's just not as entertaining with less players, with CPUs taking extra places- you can't get as many people together and CPUs usually aren't fun to race. When racing/playing co-op with friends online, is voice chat mandatory? That's what it sounds like. If I get this game I'd like to try the online out, but if I'm forced to use voice chat I'm not going to bother. Also, is classic PVP still completely gone? Alright, I wasn't onboard with all the vehicle stuff. I'm still not - I'm not getting this version of Skylanders (which is a shame) but it's about time it became online... NOW if they make the next one online with up to four players, THEN we'll have the perfect Skylanders game. I'll stick to Sonic and All-Stars Racing Transformed. Looks great, pretty excited for this and Infinity 3.0 actually. Wii online too? I know Wii U and 3DS should, but Wii too?? @Captain_Gonru - That was a good, that's a lot of content, wow. I didn't say any more b/c I haven't watched the vids yet, maybe after lunch. @Uberchu Although the Nintendo Wi-Fi Connection service is officially no more, there are still a handful of third-party titles on Wii that remain online-enabled since they're being handled by their own servers, such as FIFA 12 to 15, the last two Call of Duty games (Black Ops and Modern Warefare 3), and even Dragon Quest X.